We greatly appreciate each and every Customer. Our Customers are the Backbone of our Business. In Appreciation of our Customers, We offer our "Wellston Bucks" program. 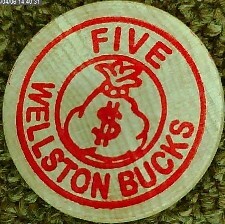 "Wellston Bucks" are wooden tokens commonly referred to as "Wooden Nickels" or "Round-to-Its" that can be exchanged for real dollars off any purchase of a Quality Pre-owned item. Each time a customer performs any pawn transaction such as making a new pawn, interest payment, or redemption, the customer receives a "Wellston Buck" valued at $1.00. 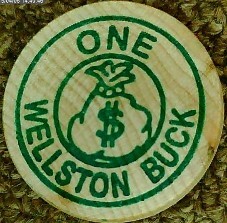 Customers also receive "Wellston Bucks" for purchases. Spend $20.00 to $49.99 and receive a $1.00 Value "Wellston Buck". Spend $50.00 or more and receive a $5.00 value "Wellston Buck". Wellston bucks are redeemable towards any merchandise purchase, or Starting a Layaway. Any amount of "Wellston Bucks" may be used at one time. "Wellston Bucks" are not redeemable for actual cash, and cannot be used towards Repairs, New Merchandise or Pawn Transactions.